Egg salad makes a wonderful lunch or a side for your next barbeque. Using mini cucumbers would make great low carb finger food too. Making homemade Aioli ensures you are eating good fats instead of processed vegetable oil. Cut the top off a whole head of garlic, drizzle with olive oil and roast in the oven for 30 minutes. Peel 3 of the cloves of garlic and place in a jug with the egg, mustard, lemon juice and salt and pepper. Blend with a stick mixer until combined. Slowly drizzle in the oil until the mixure thickens and the oil is incorporated. Chop the eggs, tomatoes, spring onions and bacon mix through the aioli. Have a taste and check if you need salt and pepper. Spoon into the cucumber boats. Who knew 10 years ago we would be replacing our starches with Cauliflower! There is cauliflower rice and cauliflower mash and even whole roasted cauliflower! This is a very versatile vegetable. This is a surprisingly tasty cauliflower base. I have sped up the process at home by skipping the step where the cauliflower is cooked and squeezed the moisture out of the raw cauliflower and it comes out really well too. The tomato sauce is quick and easy to make and much lower in sugar. Place grated cauliflower in a microwave safe bowl and cook or steam for 2-5 minutes until tender. Place in a clean tea towel and squeeze out as much moisture as possible. Mix in the egg, salt, oregano and mozzerella and form into 30cm round on a baking paper lined oven tray and press firmly. Bake at 180 degrees celcius for 20-25 minutes until lightly browned. Mix together the ingredients for the sauce and spread over the prepared base. Arrange your toppings over and sprinkle with the extra mozzarella and parmesan cheese. Remember less is more when it comes to toppings! Bake for a further 15 minutes or until lightly browned. 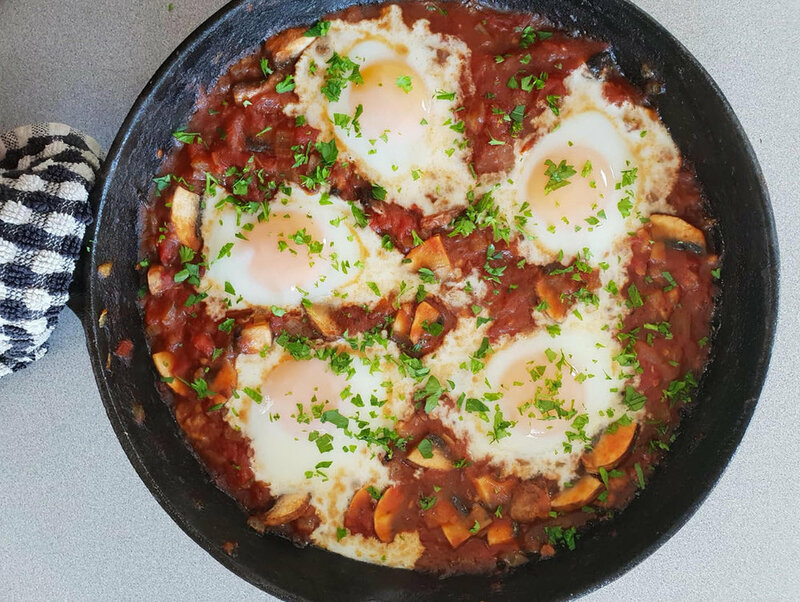 Shakshuka is a North African dish of eggs poached in tomato sauce and served in the pan it was cooked in. There are many variations depending on what you have in your fridge and pantry. It makes a quick, tasty and economical meal suitable for breakfast, lunch or dinner. Serves 2-3 people and can easily be doubled. Preheat oven to 200 degrees celcius. Heat olive oil in a pan suitable for placing in the oven. Saute onion until translucent, add garlic and dried herbs (add fresh herbs at the end if using). Stir until fragrant, add optional extra if using - capsicum, mushroom, chili, bacon or chorizo. Finally add the tinned tomatoes and balsamic and season with salt and pepper. Cook until slightly thickened. Make wells in the sauce and crack in eggs. Place the pan in the oven and cook until the eggs are just set. Sprinkle with fresh parsley or basil and oregano. The Diabetes Clinic is being established to help people reverse (Type 2) Pre Diabetes & Diabetes naturally and live a healthy, happy life. Are you ready to wow Dad and the rest of your family this Sunday with a delicious healthy Fathers Day brunch? This healthy-fat laden hollandaise sauce is made with the egg yolks left over from making the grain free bread. I posted that recipe a few weeks ago. I made the grain free bread into buns, poached the freshest eggs with spinach and bacon or ham to make Eggs Benedict/Florentine. There are other healthy options you can choose to add such as asparagus, avocado, mushrooms, smoked salmon or sliced ham off the bone. Place the cream and chopped butter in a heatproof bowl over a pan of simmering water. Stir until the butter melts. Whisk in the whole grain mustard and while whisking add the egg yolks. Keep whisking as you dont want to scramble the eggs. After 2-3 minutes you will notice the hollandaise begin to thicken. When the mixture coats the back of a spoon or you can see trails from your whisk in the sauce, remove the bowl off the top of the pot being careful not to burn yourself with the steam. Whisk in the lemon juice or apple cider vinegar and season with salt and pepper to taste. Slice and toast your grain free bread, poach the freshest eggs you can find and layer your choice of toppings on your bread and finish by spooning over your hollandaise. By making this sauce with cream it is less likely to seperate like traditional hollandaise. If you want to reheat gently place back over the hot water. This sauce is also wonderful over green veges like broccoli. - Julie Buckley, Diabetes Clinic NZ. When I was a child a treat was a special food to be eaten on special occasions such as birthdays. These days treats have become everyday foods and unfortunately all of that sugar and starch we are eating every day is having a massive impact on our health. I want to share with you a recipe for a brownie I have been working on made from whole food. It is sweetened with dates so eaten as a treat will not spike your blood sugar levels. Full of healthy fats this brownie has a surprising ingredient to help keep it moist. Preheat oven to 180 degrees celcius and line a 25cm square baking tin with baking paper. Place the drained and cooled dates in a blender or food processor with the avocado flesh, eggs, vanilla and stevia to taste. Blend until smooth. Sift together the coconut flour, cocoa, baking soda and powder. Gently mix in the date and avocado mixture along with apple cider vinegar and melted butter or coconut oil. This mixture with be very thick. Spread in the tin, you may need to use a wet spatula to smooth the top and make it even. Bake for 15 to 20 minutes testing after 15 minutes by lightly pressing the surface to see if it is set.